It’s Canadian. It involves cheese curds. It’s a heart attack on a stick. Say bienvenue to poutine. 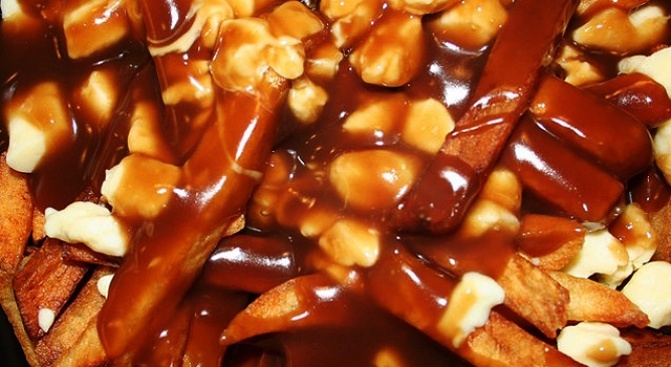 Poutine: Canada's curds hit New York's menus. Tonight at Draft Barn's (Gowanus) Onion-sponsored Unibroue beer (from Quebec) tasting event. Duck confit poutine makes an appearance on the menu at the new Hotel Griffou. We haven't tried this version. Sounds fawncy. All-pout’ eatery TPoutine on Ludlow Street will offer 11 takes on the dish, including the French Quarter, with Cajun shrimp and bourbon sauce. Should be open to the public any day now – eyeball their Twitter feed. While Park Slope’s Sheep Station pub is Australian of bent, it’s Quebecois of owner. The house poutine is made with cheddar curds, and there’ll be a three special varieties on offer June 24, on St. Jean-Baptiste Day. Shopsin’s, Stall 16, at Essex Market. Curdtastic.